Shabu-shabu (しゃぶしゃぶ, , also spelled syabu-syabu) is a Japanese variant of hot pot. The dish is related to sukiyaki in style, where both use thinly sliced meat and vegetables, and usually served with dipping sauces., but it is considered to be more savory and less sweet than sukiyaki. It is considered a winter dish but is eaten year-round. Shabu-shabu was introduced in Japan in the 20th century with the opening of a Shabu-shabu restaurant “Suehiro” in Osaka. 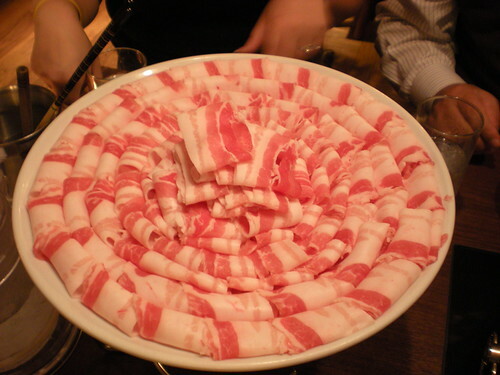 Its origins are traced back to the Chinese hot pot known as “shuan yang rou”. Shabu-shabu is most similar to the original Chinese version when compared to other Japanese steamboat dishes (nabemono) such as sukiyaki. 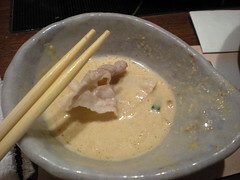 The name of Shabu-shabu was named when Suehiro served it. 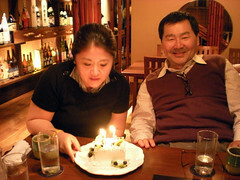 After that, Suehiro registered the name of shabu-shabu as a trademark in 1955. The cuisine rapidly spread through Asia. Together with sukiyaki, shabu-shabu is a common dish in tourist hot-spots, especially in Tokyo, but also in local Japanese neighborhoods (colloquially called “Little Tokyos” or “Japantowns”) in countries such as the United States and Canada. Our last night in Tokyo was celebrated by going to a magnificent Shabu Shabu restaurant. On the surface, the idea of taking beautifully marbled ribeye slices and boiling them in water is anathema to everything I enjoy about living in Texas. That said, I am a person who likes sauces, especially with steak, and while boiling may not have been my first choice for cooking methods, the dipping sauces accompanying the dish were amazing. I was always surprised when I’d watch Iron Chef (my only real exposure to Japanese cuisine prior to this trip) because the entire culture seems to prefer meat steamed, boiled or very lightly grilled. For me, the best part of the steak is the carmelized edges, not the pink interior. While our palettes may differ, we can agree that Shabu Shabu is a very good dish. This evening, it was accompanied by BBQ spare ribs, sashimi, salad and a host of lovely vegetables. I do find it interesting how many Japanese dishes are intended to be cooked there at the table, instead of being prepared in the kitchen. Regardless, it was a magnificent final meal.